Research suggests that 80-90% of the adult population has at least one episode of back pain during their lifetime. We see a whole spectrum of cases from office workers, new mothers, elite sportspeople and retirees suffering from back pain. As part of your treatment at Sport & Spinal Physiotherapy, your physiotherapist can use Clinical Pilates exercises to help improve and eliminate your back pain. We have already covered what Pilates is here and here . To summarise, Pilates lengthens and stretches all the major muscle groups in the body in a balanced fashion. It improves flexibility, strength, balance and body awareness. Pilates will strengthen your “core” muscles. These muscles are your abdominal and spinal muscles. Pilates will tone your body and you will develop long and lean muscles. Pilates can help you to better control your posture and alignment. It’s important to note that there is a difference between the Clinical Pilates classes offered by Sport & Spinal Physiotherapy and a regular Pilates class. Whilst both classes focus on improving your strength, flexibility and control, in a Clinical Pilates class the physiotherapist will be able to take into account an individual’s specific needs. Our physiotherapists are trained in Clinical Pilates and are able to modify, adjust and specify Pilates exercise that meets your needs. Clinical Pilates will offer you the difference between an exercise class that works for you or perhaps one that doesn’t. A lot of back pain is a result of bad posture when sitting, standing, walking or lifting. But what causes “bad posture”? A recent example of “bad posture” was of a high level kick boxer who presented to the clinic with back pain associated with increased training and competitions. On observation, he had over active trunk muscles and poor tone in his multifidus (lower back deep core muscle group). From Hodges’s research, we know that back pain changes the way you use your muscles, even after the pain has gone. So if you do a general core strength training program, it’s quite likely that this program will simply be re-enforcing the wrong muscle strategies your body has adopted to cope with the initial back pain. This particular example of the kick boxer showed his prior gym strengthening program was focused mainly on larger muscle groups, and this had, over time re-in forced the wrong muscle strategies to support his back. At Sport & Spinal Physiotherapy we have physiotherapists trained in The Australian Physiotherapy and Pilates Institute Clinical Pilates method of retraining correct activation of deep core muscles. Then, through our phased-based rehabilitation, we progress to more functional, loaded and sports specific strengthening to prevent any re-occurrences of the problem. The Australian Physiotherapy and Pilates Institute has several key elements to their Pilates method that are aimed to retrain continued neutral spine positioning. 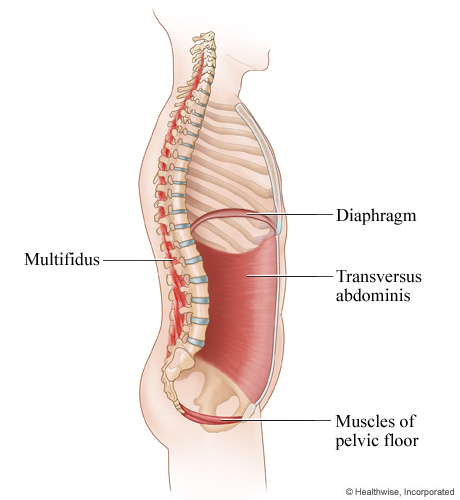 When sitting or standing I often find “rib flaring “or slouching of the pelvic position occurs. The picture above shows slouched and rib flaring postures as incorrect sitting position and then the correct neutral alignment. Starting to become aware of your pelvis alignment, correct ribcage position and shoulder blade stabilisation are some of the postural elements that are worked on in our treatment and clinical Pilates classes. You can then continue to work on these elements whilst you sit at your desk during the day at work or whilst riding your bike or running around some of the beautiful tracks in Canberra. In a Sydney Morning Herald article, Professor Paul Hodges of the School of Health and Rehabilitation at the University of Queensland, said that a one-size-fits-all program is likely to be part of the reason some Pilates exercise classes are not effective in improving back pain or muscle strength. 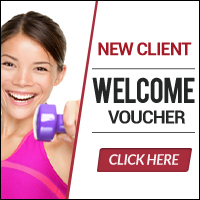 However, if you have an individualised assessment first with a health professional, who can work out the unhealthy muscle strategies your body has adopted, they can instruct you with very specific and precise exercises to correct this. When you enrol in our small clinical based rehabilitation Pilates classes, we do a one-on-one physiotherapy assessment to identify the strategies your body has developed that could be driving any persistent pain. Once we have identified which muscle group is weak, overactive, tight, not working properly we can target the correct muscle rehabilitation for you either one on one or in the small classes we run at the clinic. As part of World Pilates Day, we are offering a Free Come & Try Pilates class on May 2nd – a perfect opportunity to find out more about Pilates. If you are interested in participating in our clinical Pilates program at Sport and Spinal Physiotherapy, call us on (02) 62624464 and make an appointment to see one of our Physiotherapists for an assessment. Special thanks to Anna Crosby for assisting with the research of this article. Have you found that Pilates or Clinical Pilates has helped your back pain? Let us know in the comments. 1. Hodges, PW., Richardson, CA., 1996.Inefficient muscular stabilization of the lumbar spine associated with low back pain. Spine 21 (22), 2640–2650.